The fences came down at the exhausted end of the year when attention and time were scarce. Martin Foley, recently re-elected as the state member for Albert Park, opened the newly completed Pickles St campus of Albert Park College on 18 December before dashing off to Albert Park Primary School’s end of year function. No time to dwell in appreciation. The opening marked the conclusion – at least for now – of a project to create more space for burgeoning Albert Park College. 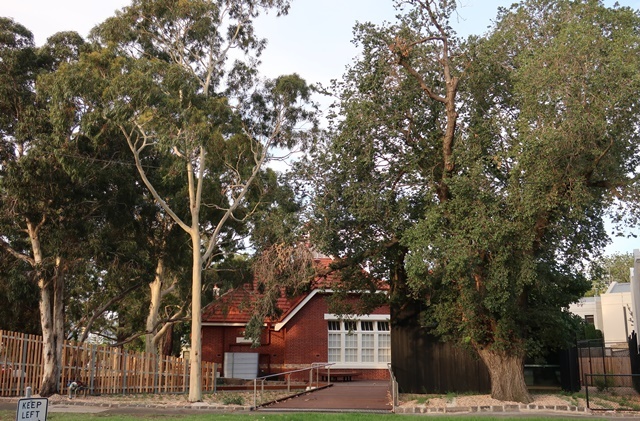 The former Albert Park Primary infant school, most recently used by Melbourne City Mission, has been transformed into a new Liberal Arts campus. 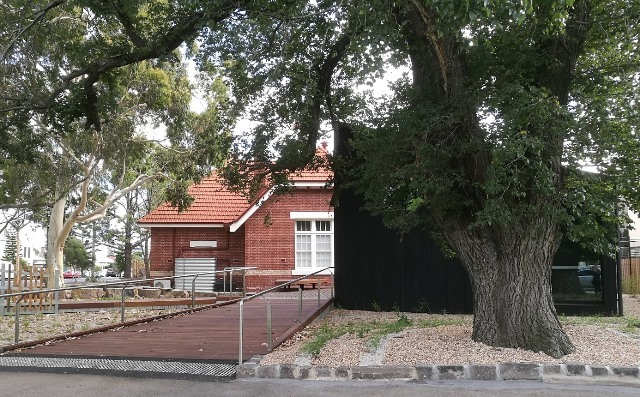 The project had three elements: restoring the heritage school building, creating new classroom/learning spaces and landscaping the garden surrounds. The holiday break has allowed time for exploring the garden and the setting it creates for the restored school and its pavilion companions. The school building had been looking unkempt. Paint was peeling from the proud blue turrets. It looked as if the school was about to be swallowed up by the encroaching trees. The school building has been beautifully restored. It had closed in 1984 because of falling enrolments. The curtain of untidy vegetation has been pulled aside to reveal the building from all angles. The restoration has strengthened the school’s presence on Pickles St with a wide and generous entrance leading to the front door. If anything, the school looks almost looks too clean, too bright, like a pair of new shoes that need wearing in. This part of the project opened at the end of 2017. But it was the second stage of the project taking shape behind the fences that had intrigued me through 2018. First to the landscape since that is what I often walk past. When the project was first mooted, neighbours were worried about what the project would mean for the trees. Old elms had been joined over the last thirty years by eucalypts of various kinds which have now attained some stature. There is also a magnificent gum, a River Red perhaps, on the Henderson Street boundary. Far from removing the trees, each one of them is respected and celebrated. Each tree sits in a bed of indigenous flowers and grasses, planted in a concentric circular pattern radiating outward from the trunk like ripples. As the plants grow, the trees will be encircled by plants – referencing tree rings perhaps? The pathways amongst and around the trees are made from blue stones, exquisitely smooth, carefully placed like stepping stones. It’s playful – feet need never touch the ground and the trees’ roots will be well protected. 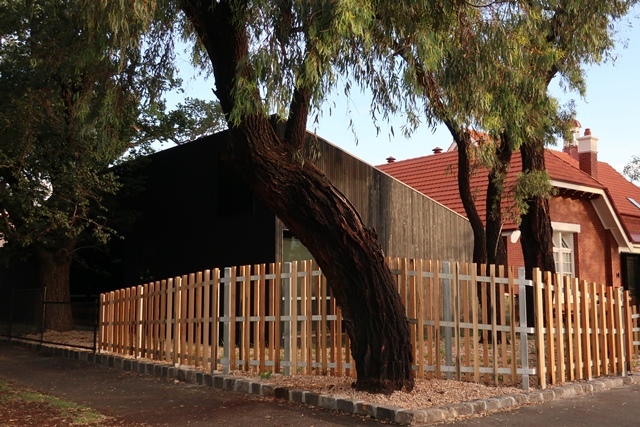 The openings in the palisade fence mean that the school feels open to the community – a hallmark of Albert Park College. It remains to be seen how the landscape stands up to the way students use the space and whether it works as the designers intended. Site Office, the landscape architects, have not only retained the trees and added many new plants, but used the trees to organise the space into smaller areas within the garden. Bench seating for the students is provided in various configurations in corners and nooks in the shade. There is also a roughly circular gathering place which you can imagine being used for ceremonial occasions. Next, to the pavilions – a pair of classrooms on the northern side with a smaller one to the south. The pavilions are very clearly secondary to the main school building which takes centre stage. The pavilions, designed by Jackson Clements Burrows, are offset and separate from the main school building. Made of black stained timber, they recede into the garden under the shade of the trees. The pavilions are austere yet elegant boxes containing flexible learning spaces. The Pickles St campus of Albert Park College joins the Year 9 Environmental Arts Hub (cnr Beach and Bay St) as fine examples of restored heritage places complemented by respectful, sensitive and clever additions. JCB describe the school as ‘a city hideout nestled among the trees’.